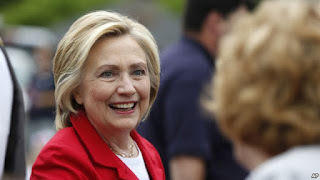 Democratic presidential candidate Hillary Clinton on Saturday accused China of stealing commercial secrets and "trying to hack into everything that doesn't move in America." Speaking at a campaign event in the northeastern state of New Hampshire, the former U.S. secretary of state and U.S. senator from New York said China is "stealing huge amounts of government information" as it looks for advantages. She said the United States needs to remain fully "vigilant" about China, which she said is establishing military installations that threaten countries the United States has treaties with, such as the Philippines. She was referring to Chinese construction projects in the contested South China Sea. After speaking at the event, Clinton marched in a Fourth of July parade in nearby Gorham, New Hampshire. In late June, the U.S. director of national intelligence said China was the "leading suspect" in the investigation into the massive cyber theft of U.S. federal employee data. The comments by James Clapper marked the first time a U.S. official had pointed a finger at China in connection with the data breach. A later statement by Clapper's office confirmed the comments, while stressing "the U.S. government continues to investigate" the hack. The U.S. has blamed China for a series of high-profile cyber attacks on U.S. government and business entities in recent years. China has strongly rejected the allegations. The hackers are believed to have accessed not only basic personnel information but also extremely sensitive data found in federal background checks.